Mr. Tobin practices primarily in the areas of Commercial Litigation, Business Transactions, Gaming Law, Real Estate Transactions, Medicaid Revenue Recovery, Medicaid Audit & Compliance Services, Workers’ Compensation Revenue Recovery, Tax Matters and Alternative Dispute Resolution. Mr. Tobin joined the Firm in 1968 and became a partner in 1970. His involvement in a number of prominent cases at both the state and federal level during this time helped to expand the Firm’s litigation practice. Today, he practices extensively in the areas of corporate, commercial, gaming and Indian law, appellate, personal injury and wrongful death and general litigation. 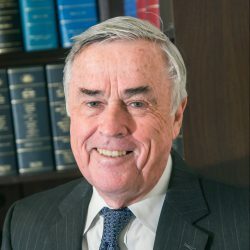 Mr. Tobin has lectured before the Connecticut Bar Association and is a Connecticut Superior Court Trial Referee. Mr. Tobin served as President of the East Lyme Little League, East Lyme Babe Ruth League and was chairman of the East Lyme Parks and Recreation Commission for over twenty years. He was honored as a “Connecticut Treasure” by Lieutenant Governor Jodi Rell for his work in recreational programs. He coached youth basketball for many years and also served as a member and chairman of the East Lyme Library Board.